Talk about bedlam today. This morning the boxes for London had to be delivered by noon as they were booked on the plane. I think Ian thought I wouldn't have them filled in time. I was beginning to think so myself. But off he went with the car all laden down and they should arrive in London tomorrow - plenty of time to sort things out if things go wrong. He had just left when a few different delivery blokes turned up - the man with many many large boxes of kunin felt arrived first - and now we have lots and lots of colours in squares and white and black on bolts. Difficult to get out the front door but the parcel postie arrived next with a big box full of new Radiant Rain misters - yummy. Tomorrow I plan a little play with them. And somewhere in there was a parcel from Doreen with my special piece I traded with her for something else. Isn't it wonderful? I love the colours and the design and the stitchery. I am planning to have it framed and hang in my studio. Then while I was sorting through the kunin felt on the front porch (imagine loads of felt flying everywhere) another man appeared with a big shipment of Valdanis. Christmas comes everyday here! Tonight I have spent ironing - no not clothes but silk loom ends - and I have been making up new experimental packs so having fun. Hoping to get into the studio tomorrow to put all my stuff from forum away and have a little play. Well I actually came back on Saturday but time seems to be impatient. Catching up takes a while. 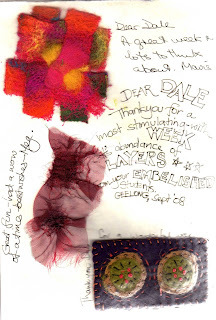 I had a fabulous time at Geelong - the bestest class and the work they did was so wonderful. 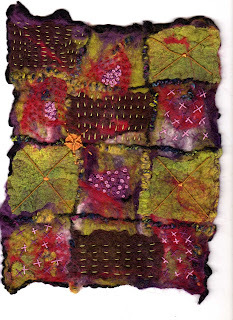 It shows the continuing inspirational stuff you can do with your embellisher. We were all tired by the end of the week and I learnt so much from my class. Thank you all if you read my blog.Ii got a wonderful card from them all - hence the 4 pages here - along with a wonderful red wine - thanks Penny - you have good taste Ian noted - very nice indeed. How come good people always know what we like? This is a little piece I made during class. I love what you can do with the loom ends and have a few ideas further. 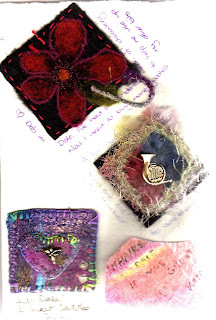 Jacinta gave me a bag of 'stuff' which I used - knitted and opulled apart and all of that and played with my embellisher. I took my Babylock on the plane but this time remembered to remove all the needles etc. Packing boxes for Ally Pally which go tomorrow so I guess tomorrow will be a busy day but in the meantime we are off to eat. Ken and Raylene are getting excited as they fly to London on 1st and will beat us. It was very nice to be back in my own bed. You will all be delighted to hear that Wellington won the Ranfurly Shield today - after 27 years in the wilderness. 27 - 0. And the Silver Ferns beat Aust in the netball and after the Warriers win last night in the rugby league, that's a pretty good run. I am off to Geelong tomorrow at 6.10am to Forum to teach and trade - just one half a suitcase to pack - that's my clothes etc part. Ian has reminded me that I am only one person and not to fuss about what I haven't taken. I will be back next Saturday. 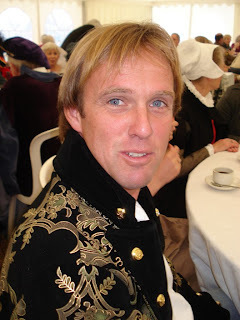 Thanks to all the people who have commented or emailed me with their sewing thoughts. I am none the wiser actually - I suppose we will get them - have to decide soon. 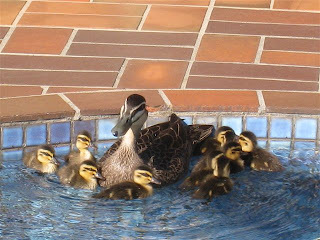 Mandy had some visitors arrive overnight - aren't they cute? Means your pool will be in good use, Mandy and justify the cleaning of it! 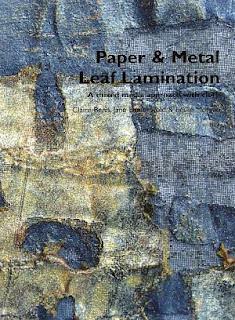 We had the new book from Jane Dunnewold, Clare Benn and Leslie Morgan arrive - Metal Leaf Lamination - another superb book - I shall take mine to read on the plane to Geelong - I have resisted more than just whizzing through as I am supposed to be packing a suitcase or two for Geelong and sorting my workshop stuff. ETC. Now I have a question of anyone who cares to answer - are people sewing? I don't mean embroidery machines, exciting hand and machine stitch - I mean actually making things with seams etc. 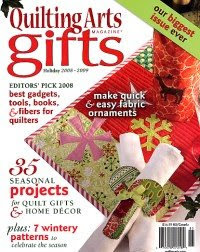 I ask this because QA has a special issue magazine coming out in November - Stitch - and I also see that Stampington has one as well called Sew. So I curious as to the demand. Would you buy the QA one? I am having to make a decision on whether or not to stock it - we do have to bring in a minimum. I haven't sewn a garment for a number or years so I need some opinions. 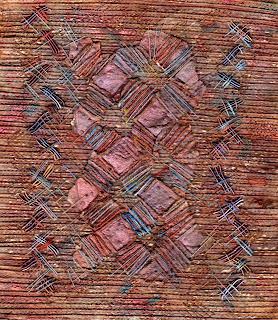 I have managed a little stitching on my Lines piece - it really isn't as red as this but I think this is Incandescent Copper trying to be stroppy. I am fascinated by what the twin needling does to hand stitching so I am planing to stitch on my commercial fabric by hand and machine before I twin needle it - might be a while in that case. Winter came back today and we had lots of heavy rain - very nice - we will soon miss it. 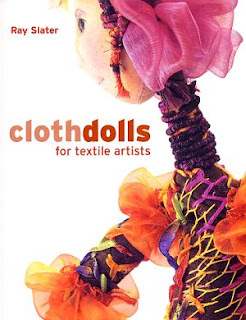 I am not a dollie person as many people know but this new book by Ray Slater which I never would have got in except that a few people pestered me, is very good indeed. It is all the other stuff which appeals to me - the interesting fabrics she has made and stuff. I have finally got my new Kimberley Dreaming Kit all made - the bookmarks arrived from Broome and I had stuff spread all around the kitchen while I got them packed. Quite pleased with it really. 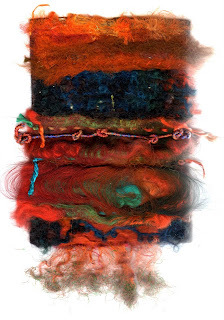 Jacinta has dyed up all manner of strange fibres for me to include - she calls some of the yeti arm pit hair but don't let it put you off. Last night we went to Musica Viva concert it was very good and our own fault we were late and had to sit outside until the end of the first piece. It was the Eggner Trio and they really enjoyed their playing and so did we. Thanks for the coment on the line piece -I am still working on it. 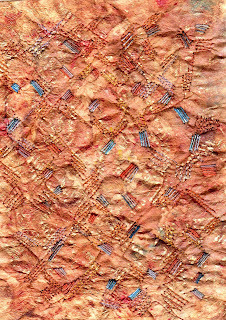 I have done rubbings on a fat quarter of hand dyed fabric - I very rarely buy fabric but I saw a pile I thought would go well with my rust stuff and I have been staring at them for some time.Ii think I will twin needle it on the diagonal and then cut it up. 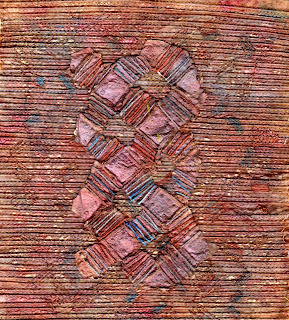 The tissutex piece is not as red as it looks - I have sprayed it with Moonshadow Mists in Copper, Blue and Red so I guess the pink is showing on the scan. I have done more hand stitching - it will be the centre of whatever it becomes. But I will have to stop and get back to Geelong thinking and packing and London thinking and packing. I have started working on my Ally Pally workshop. Tonight we are off to Sweet Java - a lovely little Indonesian restaurant we discovered not far away. I said I was playing with Lines - I have an interesting block I did some rubbings and casting with. This first pic is of tissutex sprayed with Moonshadow Mist, rubbed with Shiva stiks over my block and with aaded machine and hand stitch. Then I twin-needled it all and hand stitched my cast to the surface. More to come - I have done lots of rubbings to a piece of hand dyed and printed fabric for more development and the above piece needs mroe hand stitch. I couldn't resist this one too - it was a very satisfying end to the Tri Nations and Bledisloe Cup after a controversial time this season. Actually both sides played well and I was worried - but Ian does point out that I am always worried until the very last second. So now I can get back to more pressing matters - have started packing the boxes for London, have started sorting my stuff for teaching in Geelong, have started accumulating what goes in the suitcases for Geelong, have nearly got everything to send to Canberra for the Embroiderers' Guild display and have been playing with water soluble paper and Tissutex and Radiant Rains. I am working on some patterns which I hope to develop with hand stitch as well and thinking more of my little rust book which has been neglected lately. Plus I have found that ironing gummy cocoon strippings between two layers of Tissutex makes a wonderful surface which the embellisher doesn't mind. Oh and I still have to sort pictures for my talk at Geelong. Visit our website for the information on the embellisher challenge. Since I have seen such wonderful work from so many of you, I hope lots of you will put in an entry or two. 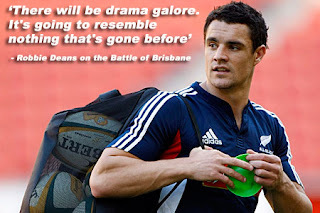 I have had a couple of people already who have told me they are - the challenge will be exhibited in Melbourne, Brisbane, Perth and London in 2009. I am really looking forward to seeing it all. 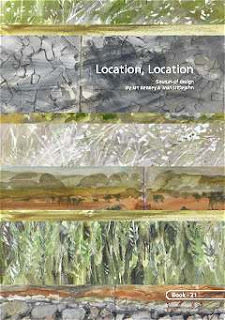 Above is a Landscape by Doreen Grey - it is a wondrous piece and should whet your appetites. You have got until the end of January to get your entry in to us. Here is Grant at Annette and Terry's 625th birthday party in Sutton. Apparently even the torrential rain outside didn't prevent a great happening. 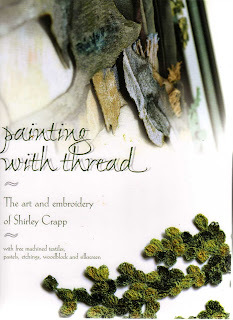 day - another round of packaging and packing but a little sneak out in the sun to have a read of this wondrous book which has just arrived - Painting With Thread by Shirley Crapp - it is wonderful to see Australian artists - Shirley has been a customer of ours for a while - I am not sure if I have met her in person but her art is exquisite. Thanks for creating it, Shirley. Springtime is a wonderful time of the year in Perth - before it gets too hot - we had a very relaxing weekend pottering about in the garden, going up the road for coffee and breakfast yesterday at Sotos before all the lucky Dads got there. Just in the nick of time too. Very lazy but at least the front garden is looking much tidier. We hav e had little birds helping us in the garden - they love our place because we have lots of trees. The bottlebrush is just starting to emerge. I have been busy packaging and packing stuff for Geelong Forum and for London - those boxes have to go the Monday after I get back from Geelong so my brain is doing two lots at once - not easy. 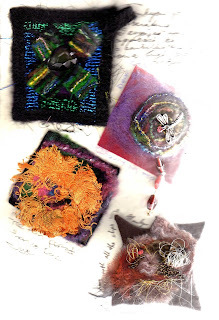 Have also finalised the next two on-line workshops - the Embellish Stitch Enrich current one is going well and they are producing some lovely work. And Ratty Tatty Papers is making excellent progress too. 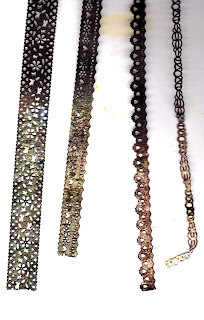 As part of my playing for that I have found this wonderful adhesive paper lace. Below is the black one sprayed with Glitz Spritz. It's wonderful. You get a packet with the 4 different laces - we currently have 3 different white ones and 1 black set and you peel off the back (which you can use as well over fusible webbing) and stick it down. All manner of possibilities. I have left the top black so you can see better when you enlarge as always. Very interesting election results in WA - hope the Nats stick to their guns and get whatever it is that they want. Announcing the inaugural worldwide embellisher textile challenge. 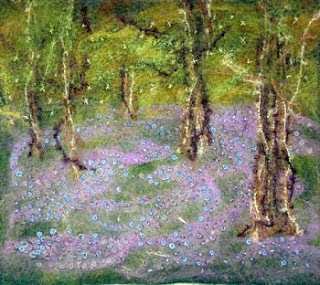 The Challenge is to create an original art work using the embellishment machine plus optional hand and/or machine embroidery. Full details and an entry form will be on our website in the next few days. The ACO concert last night was sublime - I am so used to Nigel Kennedy playing the Four Seasons I don't usually listen to anyone else. However, Alina Ibragimova played so superly and sublimely and really she doesn't look strong enough. We came home full of extra joy. The QA Gifts has arrived - over half we preordered so they have all gone off to their new homes. Anyone who came to my workshop in Wanaka will recognise my flowers in the magazine. It is a bumper issue and Beryl Taylor has some wonderful work in it in her lovely gentle style. The eeepc is back home at last and with exits and inserts and a new something which means we will be able to load pics from the camera while we are away in London etc in October. I managed to get most of my new Kimberley Dreaming Kit ready to package but waiting patiently on my postcards of Broome to arrive. And I have started on another one while I am in that sort of creative mode. 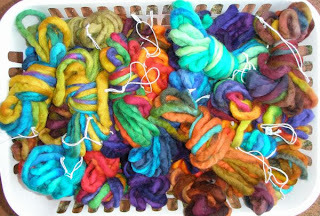 This is a basket of the rovings which we now have - nice and thick and of course beautifully dyed by Jacinta. I bought the lot so when they have gone that will be it until we manage to track down some more. They are not on the website yet (Ian has been working furiously to load new stuff this week) but in all sorts of colours - 5 metres for $3 so good value. Spring means that the bulbs are up - the early ones were the confused ones - now we have the real ones - lots of freesias and hyacinths in our garden. I can never remember what was there from other years and always get a surprise to see them again. 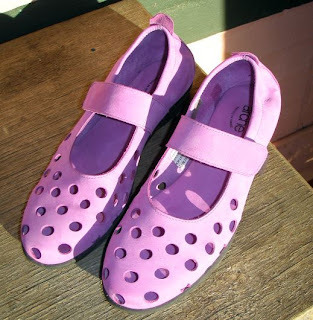 These are my new purple Arche shoes - so super comfortable. 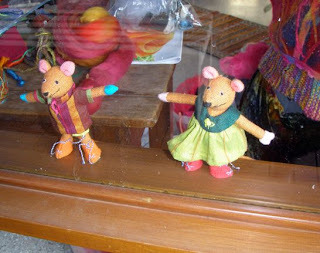 and these are the two tiny mice who peer out of the studio checking up on anyone coming in and out. 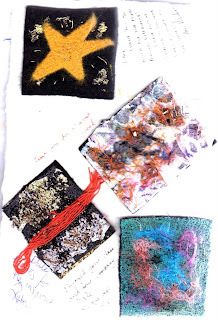 Today we have pretty well finalised the Embellish Stitch Enrich Challenge - the theme is Connections and the information will be on here and our website in the next few days. 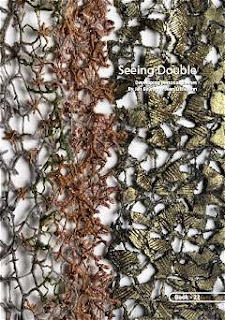 It is to be a travelling exhibition - we are just finalising the venues but hopefully Melbourne in Feb, to Brisbane, Perth, London and on our website and a couple of magazines. So polish up your embellishers and wait patiently. Tania - yes we had a lovely time in Balingup indeed and no we were not in costume but happy visitors! Alison - please do bring out your wonderful specs - I think they were from the 80s . I still have them though. Very heavy on the nose. Tonight we are off to the ACO concert - Fiona tells me it is a particularly good one so can't wait. Always a special treat. 4 new books arrived today and any minute I am off to bed to have a read. Ian didn't quite get the newsletter finished - his part - but it will go out tomorrow. Got the 4th lesson for Embellish Stitch Enrich all finished though. And I have been busy collecting up the necessary goodies for my new Kimberley Dreaming Kit - plus a little bit more playing time with silk paper making and the Radiant mists and also Colorwash. Anything in a spray bottle isn't safe around me at the moment. These are the latest 2 books in the Double Trouble series - both a little different from before - the first one explores locations really and dwells on where Jan and Jean work. If only I was so organised when I am on holiday. but there are lots of super things to think about as they explain more of their workings rather than technique. These 2 gurus of the embroidery world are always worth reading - they are both such dedicated artists. 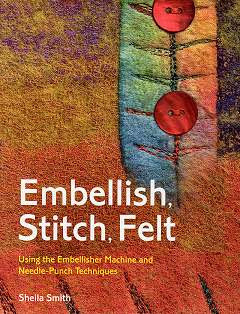 Below is the latest in the embellisher world from Sheila Smith who has written extensively on felt making in the past. This time she is using an embellisher like we do from her perspective. 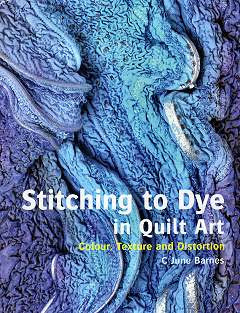 And finally, even though I choose not to dye these days, a very resourceful book from June Barnes.